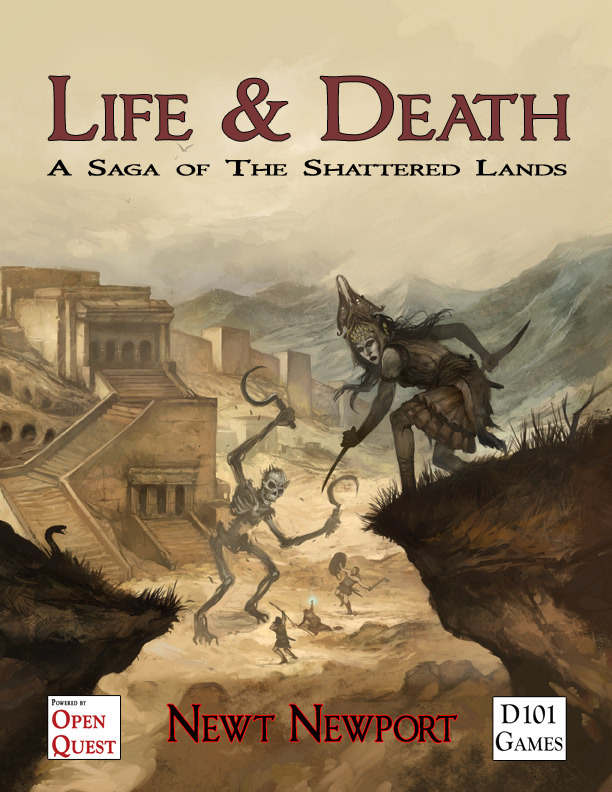 My soon to be released OpenQuest Adventure/setting book Life and Death, is meant to encapsulate what I think a good D100 adventure should have in it. This is from the introduction ot he book. Both adventures seek to highlight the defining characteristics of an OpenQuest adventure, based upon the author’s experience of playing D100 games in one form or another for twenty years. Monsters are characters too, with abilities and magic like the player characters and their own goals and motivations. Treasure is often culturally significant as well as magically powerful. Cultural detail is important. The adventure doesn’t take place in a social vacuum, the player characters start out in the fantasy equivalent of a Wild West town, travel to the adventure location and kill things and take their stuff. In OpenQuest those ‘things’ your players have just killed have friends and allies outside of the ‘dungeon’ that may take objection. The friendly town where the adventure starts and the players go to lick their wounds has its own laws and customs which affect how the local residents react. Magic is an integral part of the world, which shapes and forms it. Even in a low magic world such as Shattered Lands, the existence of magic has profound effect on the everyday inhabitants beyond the local war wizard casting Ball of Fire. Interaction with the world is not just about based around combat. Player characters have communication, knowledge and stealth skills plus magic spells as well as combat skills. Therefore player characters are better equipped to deal with a variety of situations and this scenario reflects that. Finally here’s the cover by Jon Hodgson. This entry was posted in OpenQuest, Scenario design by Newt. Bookmark the permalink.